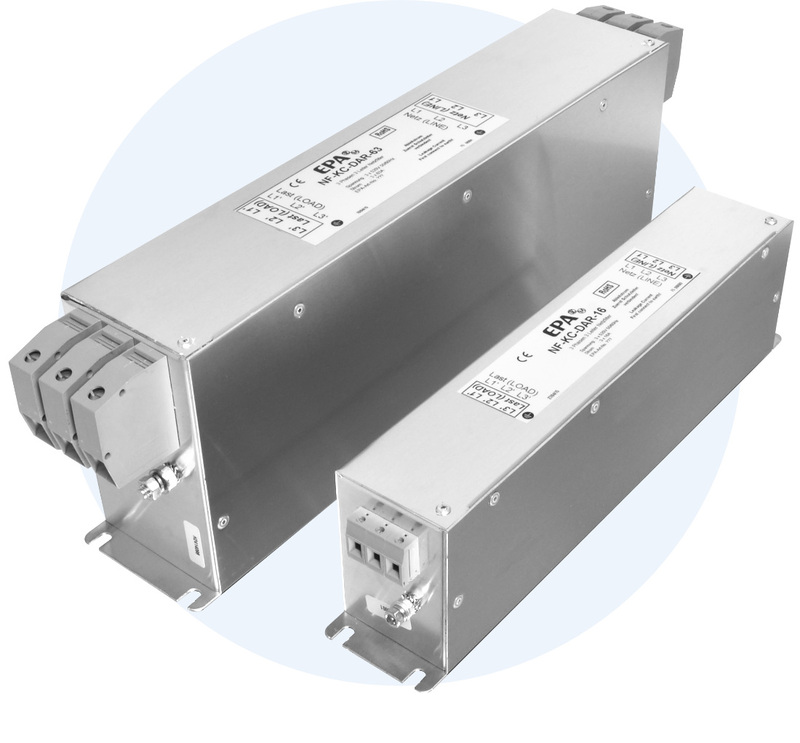 Plant operators or manufacturers who must use a residual current device (RCD, RCCB, FI) for personal or fire protection know the problem with the high leakage current caused by inverters or servo drives. The leakage currents are often so high that unwanted shutdowns of the residual current device at one or two frequency inverters can happen. This may have several causes. 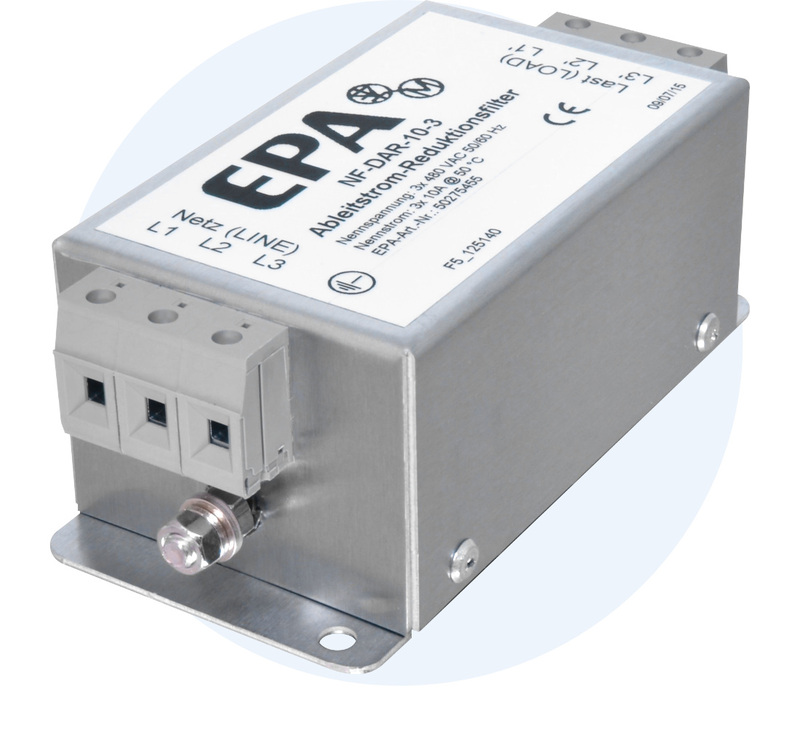 An EMC filter integrated in the frequency inverters or an external EMC filter can be a reason (leakage currents with frequency < 1 kHz). Long, shielded motor cables can be another reason (leakage currents with frequency > 1 kHz). Visualizing can be very easy with the help of Leakage Current Analysis System EPA LEAKWATCH (informations on www.leakwatch.de). For high leakage currents in the range of the switching frequencies of the motor drives the NF-DAR / NF-KC-DAR filter is the optimum solution! Operating a frequency inverter at an RCD can be a challenge! EMC measures (such as RFI filters, motor filter, shielded motor cables) increase the leakage current to values that often force the RCD to trip. Residual current operated circuit breakers (RCCBs) are incapable of recognising this key distinction between operational leakage current on the one hand and fault current from human contact or insulation defects on the other. RCDs with a conventional tripping of 30 mA (VDE 0100-410) are required for personal protection and with 300 mA or 420 mA (VDE 0100-482) for fire protection. Since the introduction of the AC/DC sensitive RCD (type B) and the effect of mandatory standards and policies that commit to its use, many plant operators are looking for solutions to prevent accidental tripping of the safety device. Even RCDs with a rated residual current of 300 mA can not always be used without any problems, so the figures 1 and 2 show. In our example, a 1.5 kW three-phase AC motor was operated at a frequency inverter with 50 meters of shielded motor cable. In the time signal of the leakage current (Fig. 1), one can clearly see that peaks occur up to 1500 mA. The switching frequencies of the frequency inverters, which are usually in the range between 2 kHz and 16 kHz, are especially crucial with long motor cable lengths. By means of a Fourier analysis it is clear that the inverter switching frequency is set to a value of 6 kHz. The amplitude reaches here 450 mA rms (Fig. 2), which is well above the tripping threshold of the AC/DC sensitive RCD (red line). During the starting or stopping of the drive, this value is even much higher. This is where the leakage current reduction filter NF-DAR puts things right. If you connect a NF-DAR filter between a RCD and frequency inverter, the leakage currents in the switching frequency range are reduced to a minimum (Fig. 3-4). The operation of one or more frequency inverters is thus possible again without problems!